Skan Group Holdings, the private family owned group which owns both Boughton Engineering and Oldbury UK, is to integrate the two businesses, whilst retaining the identities and values of both ‘iconic brands’. Announcing the move, Group Managing Director, Richard Skan says, “In Boughton and Oldbury, we have two of the most respected, indeed iconic and valued brands in the niche engineering market sectors they serve. We will keep and develop the clearly defined identities of both of these. However, from a commercial, operational and administrative point of view, it makes compelling business sense to integrate the two entities. They are co-located, they share management, workforce, skills and facilities – as well as ethos, commitment and vision. “Now is also the right time to do this, as we concurrently roll out our major investment in our new advanced ERP (Enterprise Resource Planning) software system, which will fully integrate all management and business processes including sales, engineering, purchasing, finance and administration, manufacturing and production – and even parts and service. This is about shaping our company for the long term and taking it to the next level. “Bringing together our two engineering businesses consolidates a shared pedigree and track record of over 250 years of British engineering excellence – and making it fit for the next generation. That should send a very strong message, not least to our customers and suppliers, that we have a clear commitment and vision for the future of both brands, now united within one core business”, says Richard Skan. 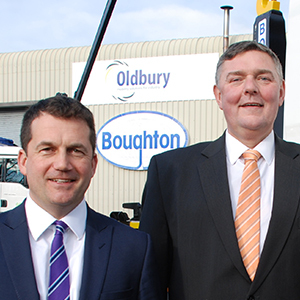 In structural terms, Boughton Engineering, a market leader in vehicle mounted waste handling equipment, will become the principal business name. Oldbury UK will be retained as an operating division, to drive the group’s established bespoke and specialist engineering activities and international defence sector work. To the outside world, including the businesses’ shared supply chains, there will be little change beyond combined purchasing, accounts and administration.